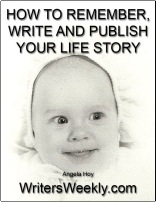 I was eleven years old when I became a successful writer. A poem I’d written had been deemed best in class. Okay, maybe that didn’t indicate real “success” but it definitely provided a great deal of encouragement! My next triumph came as a full-time mum of four. Based on my funny little creatures, I penned a column for a community magazine about life with them. I earned small monies, as well as readership and encouragement. During that time, I wrote a fantasy novel about mermaids, creatively (ahem) entitled ‘The Mermaids.’ Shortly after that, my marriage ended, which provided me with more writing fodder. Motivated, I scattered written snippets about overflowing garbage cans, threats of imprisonment for outstanding utility bills, and five ways to cook potatoes. Small payments helped keep me in the free world, inspiring me to write more. Rediscovering my identity as an independent, older woman, I entered a national humorous poetry competition…about being one. I was a sagging, self-deprecating divorcee wearing a dark sense of funny. Competition judge Vanessa Feltz crowned me happy winner, and bestowed me with designer perfume. Writer triumphant, but losing financially, I searched for a ‘real’ job. After several years of working in education, my need to write again, really write, resurfaced. Fully committed to victory through penning, I spent two years as a self-employed author, during which I gained traditional publication of two specialist educational books – one of which still actively sells worldwide, and which also been translated into Portuguese. Reaching a new threshold of fiscal famine at one point, I took part-time work in a carpet shop. Meanwhile, my mother the meddler contacted a local newspaper about my books. The journalist who interviewed me suggested I apply for a local community correspondent vacancy the paper would be advertising. I reigned over that role for eighteen months until, for a second time, school work buried me. And, I got a heads up on an upcoming post I’d apparently be perfect for. During twelve years of that conventional employment, my writing legs refused to buckle, and readership and rewards kept coming. Earlier this year, I embraced my redundancy from mainstream to focus on writing professionally. Write, submit, repeat. I’ve again been accepted for print, and am also in the process of pitching another book. For me, successful writing is a constant pursuit, a willful walk in search of producing literary treasure. It includes being misguided, lost, diverted, blocked, and mentally kidnapped. It’s a force to forage, feast, and overcome famine but always, through it all, to continue to thirst. It’s also about being printed, read, and paid; all vital to educate and/or entertain the masses.